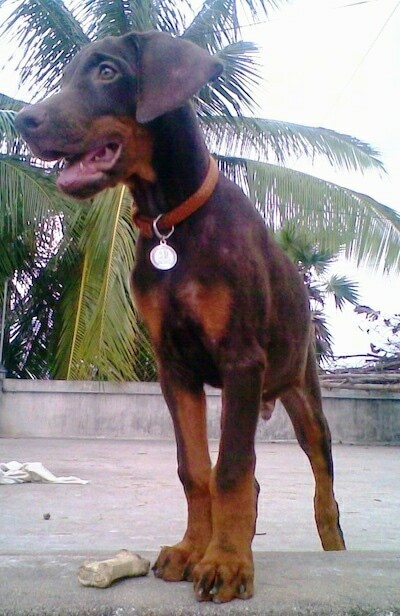 Caesar the Doberman Pinscher puppy at 3 months old from India—"He is very cute and always naughty. He is very special to us and we love him a lot." 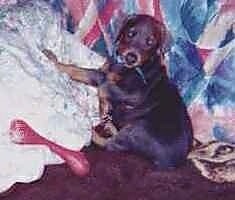 "Introducing the ladies of our lives, Jazzmin and Cynamun, shown here at 8 months old. 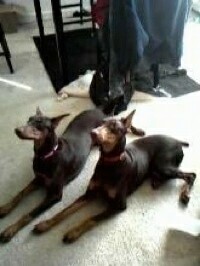 A Dobie dream team—they do everything together but they are completely different. Jazzmin (darker face) is excitable, a tad bit nippy, and a crybaby in a way and Cynamun (lighter face) is more stand-offish and makes the best of her situation at the time. 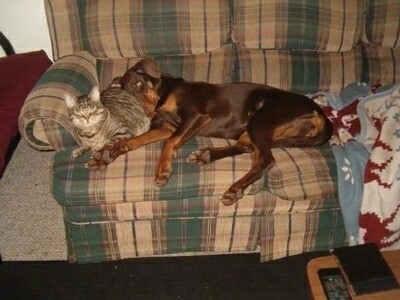 We watch The Dog Whisperer every day. It’s set to record with the DVR. We are believers now. 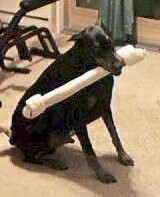 We practice his techniques with success (for the most part). 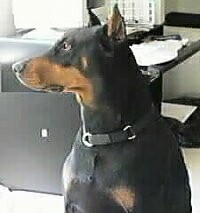 By watching Cesar we saw that the girls were really being humanized by me and my mother, but we have since learned the error of our ways and are well on our way to being the calm, assertive pack LEADERS they need!!!! 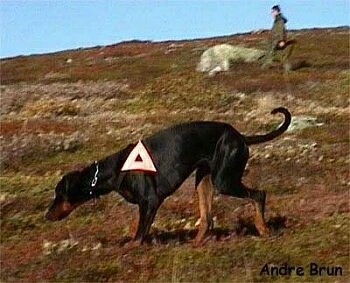 They can be very dominant, but that is unacceptable these days. 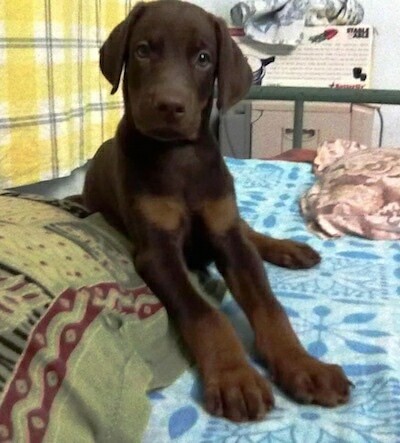 They are becoming happier, more balanced pups every day." 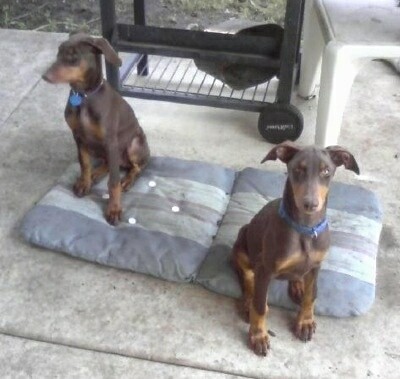 "Jazzmin and Cynamun the Dobies on the back porch by the grill—tt was their favorite spot at 3 months old." 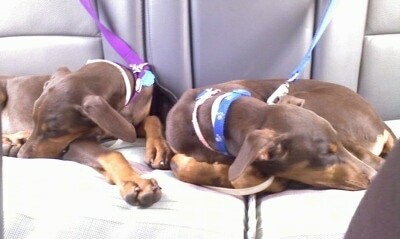 "Jazzmin and Cynamun the Dobies napping in the back seat on one of their many car rides at 5 months of age." 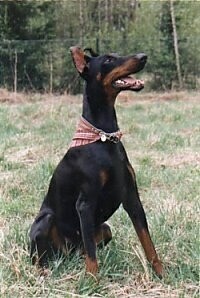 This is Nadia (D'Nikons Dulsineja Doboska). 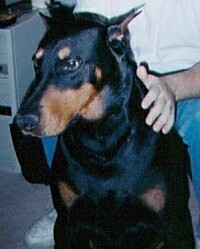 She is a black and tan Dobermann from Finland, originally from Russia. 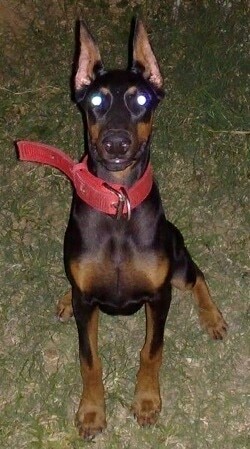 "Debbie, our 6-month-old Doberman Pinscher puppy has a very good ball drive. 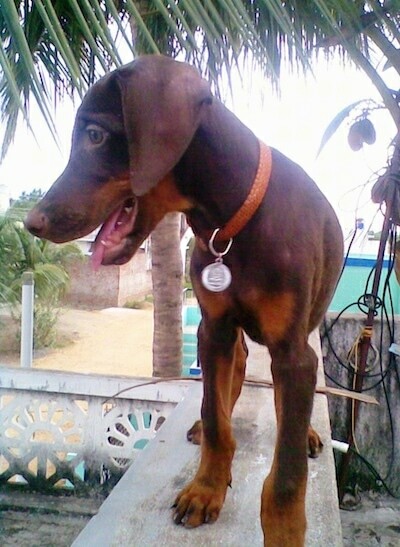 She is really energetic, loves to chase the cats outside and loves to run circles around you. 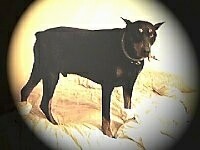 She has a daily exercise of long walks in the morning and at night." 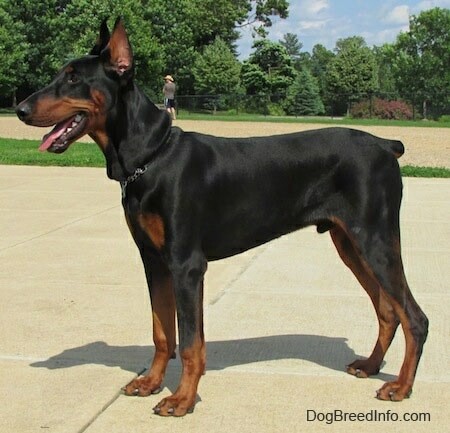 "Ruka is a 1-year-old, red Doberman with an uncropped tail and ears. 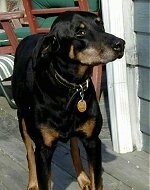 Her best friend is Auggie, a Boston Terrier." 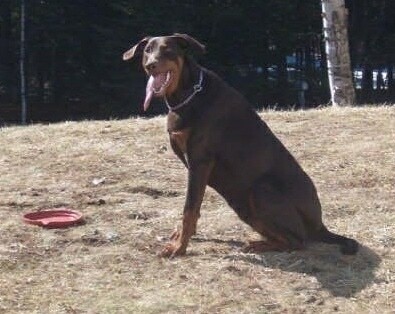 "Ruka loves to play Frisbee and loves to play with Rez the cat." 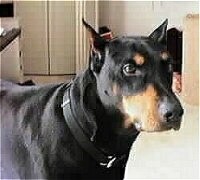 Ruka is an example of a Doberman with a natural tail and ears. They have not been cropped or docked. 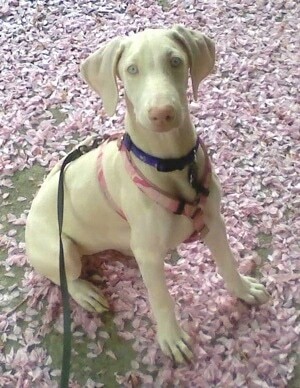 "This is my white Doberman Pincher puppy Vera at 3 and a half months old. She's very smart and learns quickly." 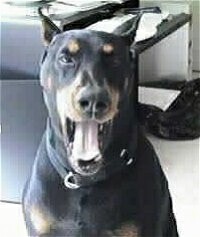 "This is my Doberman Pincher Dobis at 8 years old. 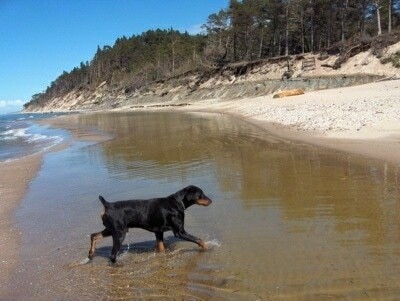 He lives in Latvia, Europe next to this beautiful seaside, and just loves going for a walk with his friends." 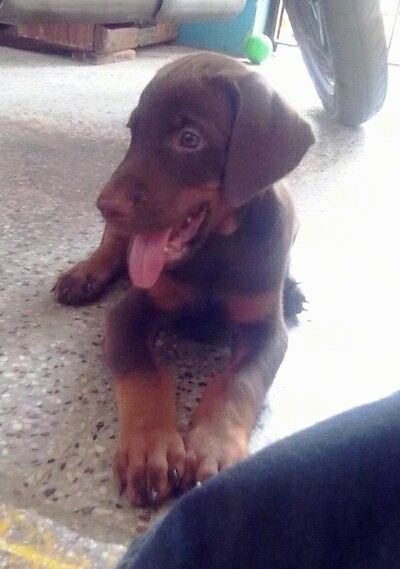 This adorable little puppy is Twister at 7 weeks old. 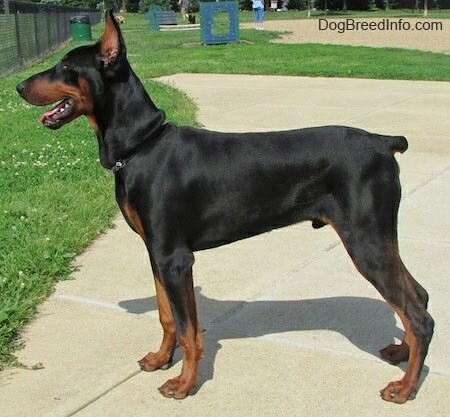 He is an example of the blue variety of Doberman. 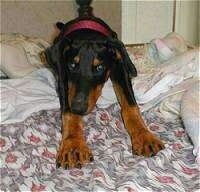 Lacey is taking a big stretch on the bed! 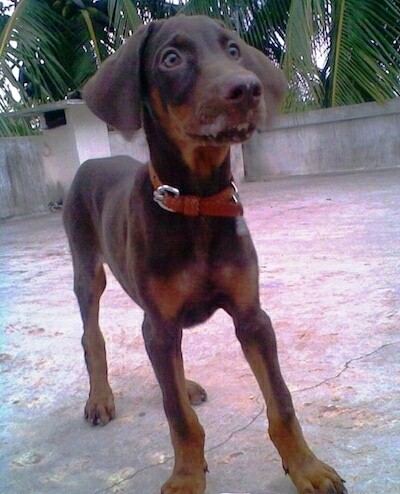 She is a Doberman Pinscher with natural ears and was 5 months old in this picture. 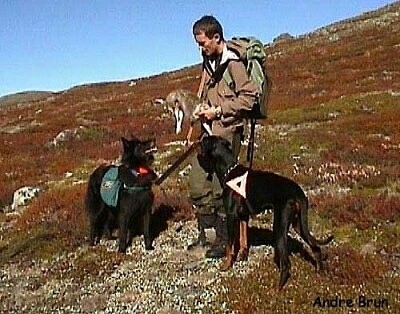 Doberman at work in Norway, photo courtesy of André Brun. 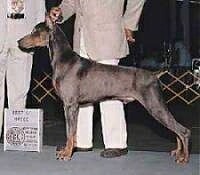 This is an example of a Doberman with a natural tail and ears. They have not been cropped or docked.